Up until the construction of the Wivenhoe Dam the Brisbane River was subject to frequent flooding. However, even with the artificial lake which was built in response to the devastating 1974 floods it unfortunately just couldn't cope with the unprecedented falls that lead up to the floods of 2011. Floods over the past couple of hundred years have caused havoc on people of Brisbane but also resulted in the river depths decreasing and deepening and the creation of new shoals and sandbanks. Since European settlement there have been major floods in the following years: January 1841, March 1890, February 1893, February 1931, January 1974 and most currently January 2011 (view this timeline of the Brisbane River). In February 1893 the river burst its banks and flooded the city in response to a tropical cyclone. The water was recorded at 8.35 metres above low tide level which is the second highest ever recorded at the City Gauge. The Great Flood of 1893 is also known as the Black February Flood as it was responsible for the lives of 11 people and the hospitalisation of 190 people. The southern part of the city closest to the river was the most severly affected. The surging waters destroyed the Victoria Bridge and the railway bridge at Indooroopilly causing an estimated $4 million, a vast amount in 1893. The river flooded twice more within a fortnight of the main flood, both times due to tropical cyclones crossing the coast. 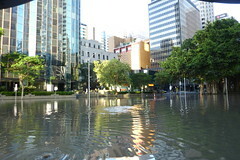 The floods which occurred on the 27th of January 1974 are considered to be the largest floods to affect the city of Brisbane in the 20th Century. 1973 had seen an extremely wet Spring with the river system at capacity by the end of October. However, it was Cyclone Wanda that caused 642 mm of rain to fall on the city during a space of 36 hours. The floods peaked at 6.6 metres according to the City Gauge which led to the River breaking its banks and causing around 8,500 homes to be flooded and the formation of a 200 square kilometres inland sea. During this time fourteen people lost their lives, mostly in inner city suburbs. The total damage was thought to cost $200 million. As a result of these floods the Wivenhoe Dam and other flood mitigation measured were implemented to help control water levels so that this kind of devastation would never come upon the people of Brisbane again. Read more about the "Big Wet" floods in Brisbane in 1974 at the Bureau of Meteorology website. Unprecedented and prolonged rainfall during December 2010 in Queensland was caused by a strong La Nina weather pattern, setting record high rainfall totals in over 100 locations for the month. The heavy and widespread rain continued in January, culminating in the Queensland river catchment system which feeds into the Brisbane River being overcome. The Brisbane River banks broke on the 11th of January 2011 and river levels peaked on the 13th at 4.46 metres, the sixth highest in the city's long history. By this time many thousands of houses had been evacuated and streets closed due to flooding precautions. The peak caused approximately 20,000 houses to be affected by flood waters with St Lucia, West End, Rocklea and Graceville amongst the worst affected areas. Much of Queensland was declared a disaster zone due to the flooding with 35 lives lost and approximately 200,000 people affected by the floods state wide. While this was a devastating natural disaster, Brisbane, along with the other hard-hit regions, is well on its way to recovery. The damage was initially estimated at around $1 billion however final figures have not been settled.